It starts as soon as the weather gets cold, sometimes as early as September, definitely by late October. There’s a chill not only in the air outside but inside too. Not in the house but in me. The only thing that chases that chill away is to bake and it has to be cookies. I never really paid it much mind until this year. I felt so lousy for most of the past several years that a batch or two was about all I could pull off and the urge to bake was only another ache to be tolerated. But this year, even with being back in school and the craziest busy season I’ve ever seen at work, I baked nearly every single weekend with energy to spare. Batch after batch after batch. 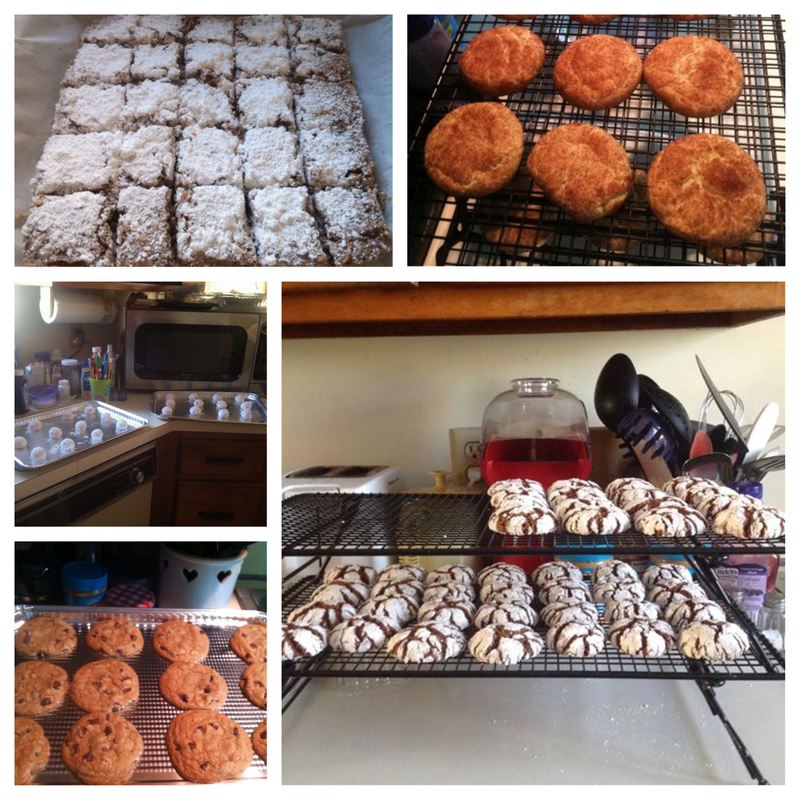 Snickerdoodles, Date Bars, Chocolate Chip, Chocolate Snowflakes, Molasses Spice Drops, Scandinavian Butter Cookies and Mini Chocolate Chip cookies filled the cookie tins. I even wore out the old mixer. (In my defense, it was as old as I am.) I baked old school, grinding dates with my Grandma’s 100 year-old cast iron meat grinder and dusting confectioners sugar with Mom’s 60 year-old sifter. I spent my Saturday mornings sipping a strong cup of Irish tea, paging through the bright pink book known around here as simply The Cookie Book, and scoping out new things to try. The funny part is, I don’t eat most of them. The boys do. Mom does. My sister does. I take them to work. I randomly drop them off to friends or neighbors. I’m in it for the making, not the eating. I started to pay attention to what I was doing. I’m not a neat cook but I am a logical one. There’s a system to my madness. I have to work left to right and the ingredients go back into the cabinet once I’ve measured out what I need. I’ll only use one set of measuring spoons even though we have two. I have my good cookie sheets that no one else dares to use. My phone is my timer and I know how many cookies I can get on the trays before it’s time to rotate trays from oven to cooling rack. Cookies are all about precision. Even when I tinker with my nearly-perfected chocolate chip recipe, I know exactly how much extra brown sugar I can sneak in or how much less vanilla I can use. So I was furious with myself when I screwed up a batch of chocolate snowflakes using baking soda instead of baking powder. They were beautiful but they were hard as rocks. Such a simple thing really. Most of my cookies use baking soda and I reached for it out of habit. It wasn’t until after the cookies were done that I realized what I had done wrong. Mom and I ate them anyway. Chocolate is chocolate after all and, dunked in hot cocoa, they softened up quite nicely. But that mistake slowed me down a bit. I paid closer attention to what I reached for, intentionally reading what I needed and not working out of habit. I noticed something else along the way. In seeking out new cookies, I was gravitating towards recipes that were more labor-intensive than my old favorites. Most needed to be mixed then chilled for a few hours and then rolled into balls, then rolled in sugar, cinnamon or some combination of the two. It takes time to roll 70 cookies into perfect little balls. And it finally dawned on me last night, as cookies covered every flat space in the kitchen that this is what I was seeking: the time to slow down and work logically, methodically and precisely when everything at work and school and with the kids was out-of-control crazy. I need the time to make a huge mess and then bring it back into perfect order. There are only so many ways I know to pull that off: writing, stitching and baking. If I pull out my stitching or sit down at the kitchen table to write, suddenly everybody needs something from me. But if I pull out the mixing bowls, the kitchen miraculously empties for a couple of hours. Left alone in my mess, the crazy burns out in the oven, the stress washes off in the sink and the chill inside dissipates … at least for awhile. What comes out of this oven is only as good as the combination of what goes into it. Life is like that too. It’s okay to have out-of-control crazy but only if there’s a slow down somewhere to balance it. So if you happen to wander into my kitchen during these colder months and it looks like the cabinets may have exploded, it’s okay. I’m just meditating. And if you leave me be, I promise you, I will bring order from chaos and something sweet will come of it.